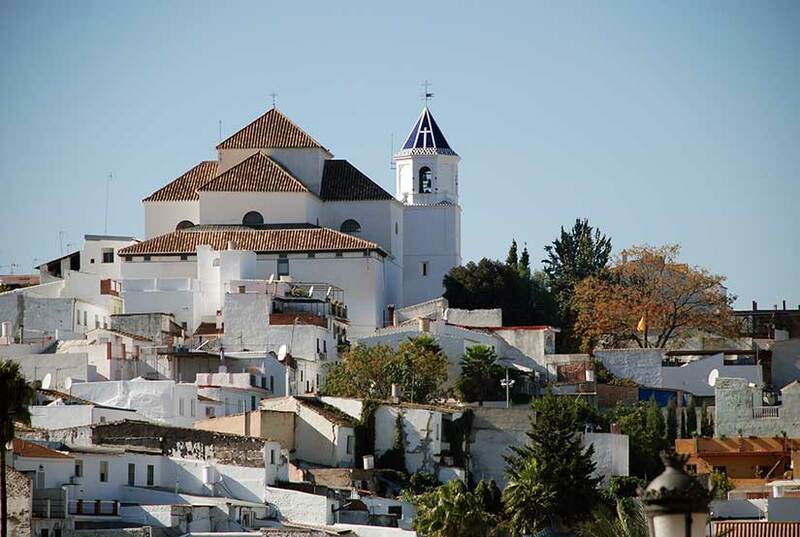 Situated at the foot of the northern face of the Sierra de Mijas, looking out over the spectacular Guadalhorce Valley, its territory is made up of citrus and other fruit trees and vegetable gardens. Neolithic, Phoenician, Greek, Roman and Arabic settlers have all left their mark on the area. Today, Alhaurin el Grande is a prosperous village whose most interesting monuments are Our Lady’s Church, the Town Hall and Montellano Palace. Also worthy of mention is Los Corchos Mill, which is still in excellent condition and works exactly as it did in Moslem times. However, the village’s origins are also heavily linked to the presence of the Arabs. Its name appears to be derived from the Berber tribe of the Benu-Atus, Al-Atuiyin, though legend has it that it comes from the name of the daughter of the second Moslem king of Ronda Algotisa, who chose to build a palace on this site. The Phoenicians exploited the AREA’s silver and lead mines. The presence of a Roman town of some importance is evidenced by the abundant remains from the period to be found here, such as the aqueduct on the road to Coin, capitals, columns, headstones, sculptures, coins featuring Dioclecianus and Probus, and Cerrogordo ruins. Its Roman name appears to have been Lauro Nova, and it is generally thought that this was the ancient Lauro were, according to Floro, Gnaeus Pompeius, son of Pompeius, was killed by supporters of Julius Caesar, though no proof exists of this. The Arabs gave it the name Alhaur, meaning “the valley people”, due to its location between the Faala and Arroyo de la Villa valleys, and built a fortress which dominated the AREA. This castle was blown up by the French in 1812; the parish church was later built on its foundations. Remains of other Moslem fortresses also exist in the municipal AREA, such as those of Jurique, Faala, Mentage and Rabaquel. In 1487, the village was conquered by King Ferdinand, following bloody assaults on Coin, the fire and massacre of Benamaguez (Casapalma) and the capture of Cartama, its habitants fleeing to Marbella; its land and castles were shared out among the Christian settlers, though a further redistribution was undertaken in 1492. Alhaurin el Grande, which belonged to the Crown, was dependent on the jurisdiction of the city of Malaga. In 1634, its inhabitants bought this jurisdiction along with independent village status for the sum of 4,459,916 silver maravedíes. King Ferdinand VI revoked this autonomy and placed the village under the jurisdiction of first Coin, then the Crown itself, adding the Fleur de Lys of the House of Borbon to its coat of arms. This coat of arms also features the Golden Fleece awarded to the village by Charles V for its loyalty during the Regional Wars.